Nelson Mandela turns 95 while in hospital in Pretoria, as events take place around the world and in South Africa in his honor. South Africans are being urged to match the former president and anti-apartheid leader’s 67 years of public service with 67 minutes of charitable acts. Nelson Mandela, who is in critical but stable condition with a recurring lung infection, entered hospital on June 8. President Jacob Zuma said his health was “steadily improving”. “We are proud to call this international icon our own as South Africans and wish him good health,” Jacob Zuma said in a statement. “We thank all our people for supporting Madiba throughout the hospitalization with undying love and compassion,” he said, referring to Nelson Mandela’s clan name. Nelson Mandela’s daughter, Zindzi, said on Wednesday he had made “dramatic progress”, and that she had found him watching television with headphones on and communicating with his eyes and hands when she visited him this week. “I should think he will be going home anytime soon,” she told the UK’s Sky News television. Nelson Mandela’s birthday is also Nelson Mandela International Day, a day declared by the UN as a way to recognize the Nobel Prize winner’s contribution to reconciliation. The former statesman is revered across the world for his role in ending apartheid in South Africa. He went on to become the first black president in the country’s first all-race elections in 1994. 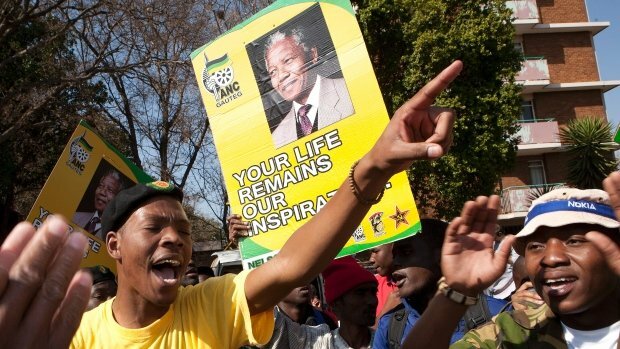 The ruling African National Congress (ANC) said that on this Mandela Day homage was being paid to 95 years of “life well-lived”, dedicated to the liberation of South Africans and people all over the world. The day kicked off with millions of school children across South Africa singing Happy Birthday to Nelson Mandela. To mark the former statesman’s 67 years as a lawyer, activist, prisoner and president, volunteers will spend 67 minutes renovating schools and orphanages, cleaning hospitals and distributing food to the poor. President Jacob Zuma plans to mark the occasion by overseeing the donation of houses to poor white families in the Pretoria area. The ANC said that on this Mandela Day homage was being paid to 95 years of life well lived, dedicated to the liberation of South Africans and people all over the world. Events are also taking place internationally, with an image of a large Mandela painting by South African artist Paul Blomkamp featured in New York’s Times Square. British entrepreneur Richard Branson has pledged 67 minutes of community service on Thursday to “make the world a better place, one small step at a time”, speaking in a recorded message. Meanwhile, concerts are planned later this week in the Australian city of Melbourne, featuring local and African artists. His illness gives extra poignancy to this year’s Mandela Day, correspondents say. For South Africans, the best birthday present for Nelson Mandela would be to recover and be among the people who love him most. As the family and millions around the country reflect the role Nelson Mandela played in South Africa, there will be a quiet prayer that he will return home soon. Winnie Mandela told a local radio station her former husband’s 95th birthday was “a gift not only to the family… but to the nation”. She rejected the “prophets of doom” who have warned of chaos in South Africa when Nelson Mandela dies. “The country will solidify and come together,” she told Radio 702. Nelson Mandela’s third wife, Graca Machel, said last Friday that she was “less anxious” about his health than before and that he was continuing to respond well to treatment. Thursday also is the 15th anniversary of the couple’s marriage. Ahead of the anniversary, Nelson Mandela’s close friend and lawyer George Bizos described them as “a loving couple”, the AFP news agency reports.